Known faults in the US Army's Patriot missile system may have caused an RAF plane to be accidentally shot down in Iraq last year, the BBC has found. 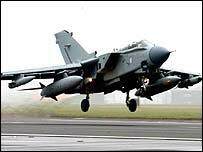 The US originally suggested a problem with the Tornado aircraft itself led to the friendly fire incident near Kuwait. 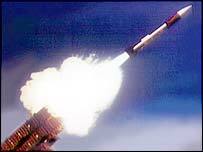 But Radio 4's Today programme has uncovered evidence that the US unit which fired the missile knew there was an error in the Patriot system. RAF findings on how the two airmen died have not been made public. An RAF report on the March 2003 incident is believed to have been forwarded to the Ministry of Defence but the MoD says it cannot comment until the report is finalised. The two airmen killed - Flight Lieutenant David Rhys Williams and Flight Lieutenant Kevin Barry Main - both served with 9 Squadron, RAF Marham. US journalist Robert Riggs was embedded with the Patriot unit which shot down their RAF Tornado. He told the Today programme how the US Army responded to the incident. "The soldiers that we talked to said that the British Tornado was identified as an enemy missile and the story that the army put out to its own soldiers in the hours after that incident was they were blaming the British flight crew." Mr Riggs said the US Army claimed the RAF airmen had not turned on equipment which tells radar systems like patriot whether a plane is a friend or an enemy. "But what the army never disclosed publicly at the time was that the army Patriots were mistakenly identifying friendly aircraft as enemy tactical ballistic missiles", he added. Robert Riggs told BBC reporter Gordon Correra such misidentifications were occurring dozens of times a day in the army unit he was with. Ted Postol, Professor of Science Technology and National Security Policy at the Massachusetts Institute of Technology and former scientific advisor to the US Navy, told Today that aircraft - whether identified as friend or foe - do not look like missiles. "A ballistic missile travels at higher altitudes and at higher speeds and in either an ascending or descending trajectory, which is highly predictable. "So there's no way, if they accurate track information, that they would misidentify an aircraft or a ballistic missile", he said. Philip Coyle, a US assistant secretary of defence for testing and evaluation between 1994 and 2001, told the programme: "The Patriot system is designed to be pretty much automatic. "These accidents have shown that this is a problem with the Patriot system, not with pilot error, not with identification systems." Gordon Correra said a "lessons learned" report put together by the US Army after the war confirms that non-existent ballistic missiles appeared in the Patriot system. The document also points to a lack of training for operators on how to deal with problems and the fact that Patriots had never been tested across the kind of ranges and in the kind of confused airspace experienced in the Gulf. It says knowledge that false identification of ballistic missiles was occurring was not shared by the Patriot units that first operated in the Gulf with those that arrived later.